which is the same encryption standard used by banks to secure customer data. : It does not send any of your notes without your signing up. Thanks for the Update, looks good. I'm still having issues with the backup though, can you please help? I'm on a HTC Desire HD, and would love to get this issue sorted. Please help! Wow, 2x2 widgets are amazing. I love them. And sync is a very awaited feature, but (don't get me wrong) I'd rather sync with gDocs or gTasks. Before I sync up my notes, I'd like to know some basic things: where will they be backed up, for how long, how secure, how many notes allowed, is there a web interface, and the like. Many thanks for this great app. I lost colornote widget after upgrade to recent version. I used to have that widget in list of available widgets, but now I don't. I tried to uninstall & reinstall apllication, but it haven't helped. I can run colornote application, but not widgets. I use android 2.3.3 on galaxy s.
Hi, tried ColorNote 3.6.0 on Galaxy Tab 10.1 but I crashes if I turn the display or go into setting and scroll the pages. Anyone else using GT 10.1? Is there attachments support in plans? Trying to restore a backup(release 3.6.2)But from the 3 notes in the backup only one is shown in the "main overview window" the other 2 notes dont seem to exist. How can I make them all visible again? The backup clearly states 3 notes. Colornote was running on my sd card when the backup was made. I also have lost my 1x1 checklist widget (HTC EVO) after updating to 3.6.0. There is no colornote choice anymore even if I wanted to put it back. I updated my Lg Optimus One to 2.3.3 & tried to restore the auto backup from colornote but itz not accepting the password, I tried "0000" as well, but no luck. nice work, I love this tool. I think I found some kind of error. If you don't use return everything is fine, but return + [ seems to be not very useable. A while ago I moved to GTasks because of the synchronization. Lots of other aspects were missing, but the sync was there. Could I possibly suggest a feature? - Moving checklist items between notes. A suggestion that seems the natural evolution of the checklist reordering you added in the past. It would make checklist reorganization/clustering a glimpse! It would be great to sync with gtasks. Thanks for a great app! I had to reset my phone and reinstall my apps. Is there any way for me to access the data on my simcard...? I signed in with FB were did my backup go? I had to get a new EVO and had 17 notes in my backup. The restore is only restoring 1 note. Please help, thanks. Will it be possible to Sync it with Microsoft Outlook in the future ? Okay, now why was ColorNote rendered "incompatible with your Verizon HTC ADR6300"? It's the original HTC Incredible on Verizon Wireless and always worked in the past until now. where is the online backup? And why does it say it will wipe out everything if I sign out? Very nice little app! Question: Can notes be printed directly via CloudPrint? Hi- Can I sync my Color Note with my PC? I want to be able to see and use my task list or notes on my PC as well. If I could "share" with DropBox or download a PC version of ColorNote, that would take care of this issue. When attempting to restore my notes (using the correct password), it says "Done" but the workspace remains empty. I have the .dat and .idx files from the SD card, is there at least a way to manually retrieve my information? Is there any way to access sync notes from a web UI? That could be useful if I need to type in a rather big note, instead of using the touch screen. I have old dat files from colornote on my old phone, I would really like to migrate my old data, or at least know what it was in a readable format so I can put it into colornote on my new phone. How is this possible? I had notes backed-up to SD card. After upgrading to latest version, I lost my widget and my notes. I had to reinstall the app to get my widget functionality back but I'm unable to restore backed-up data. The backups are appearing in the options and It does let me go through the motions of restoring the backups, but the restore does not work. I found the backups on the SD card but of course, I cannot open them. How can this be fixed? I'd love to be able to open the notes I backed-up to my SD card. "connection expired please sign in again" - i get this message over and over again. I want get rid of it. But how ? Hello my name is Alejandro Garcia from Golden Gekko. we would like to put forward a business proposal for your app (ColorNotes note pad ). who should we contact, name, phone, email? I have a small feature suggestion: Can you add an option to have the reminders only occur if the checklist is non-empty? My use case is that I have a permanent note called "Immediate TODOs", which are things that I need to do ASAP. So I'd like to set up a reminder for that note. However most of the time, the note is empty, in which case a reminder is just annoying. I think other users would also find this useful, and from a programming standpoint it is really easy to implement. I am having issues restoring my notes. I have 35 showing in my backup but only 2 are appearing. I have no password and no password is being requested. I just restores 2 instead of them all. What do i do? Is it possible to add a note into workspace when a note was created in calendar ? Hi...I had ColorNotes on my HTC Hero, and I backed it up to my PC before I upgraded to Sprint Google Nexus. How do I restore my backup files? I can't find any option that will allow me to do so. And where should I place the backed up files on my Nexus...USB or primary storage? Sync is good. but could it be built out so I can sync notes with my family. Like google calendar? I have 2 questions. 1. Why does the today widget only show the check list notes and not the text notes. 2. Why did my widget not update today. It is still showing my list from yesterday. You can email me at zacharyrharner@gmail.com if you have an answer for me. i also want to add that in my Iphone. can you answer me that how can i do that ? ColorNote keeps me organized! My phone's home screen is dominated by ColorNote widgets to keep me on track throughout the day. I'd like to make one feature suggestion: Add a widget corner-menu option to go directly to the Workspace. Hi; I love this app but have a question...after a recent update, I get the error message "Connection expired please sign in again." I don't remember my password and there is no "forgot password" option. Please help! Thanks! PS my email addy is southnmist@gmail.com if you have an answer for me. Thanks! Hi, ColorNote is great, but I too get the connection expired message all the time. I needed to do a cloud backup once, after that I logged out and ColorNote complained; I've tried uninstalling and reinstalling the app, and the "clean app data" approach earlier, but neither has helped - somehow ColorNote still remembers that it used cloud backup once. Maybe a simple settings switch to turn cloud backup on/off would solve this? 일단은 컬러노트를 덕분에 잘 사용하고 있는 사용자입니다. 홈페이지는 다 영어로 되어있지만 검색해보니 안드로이드펍이라는 곳에서 활동도 하시는것 같아서(제가 영어를 잘 하지 못해서;;;) 한국어로 보냅니다. 다른것이 아니고 열심히 하루종일 검색을 해봤지만 해결책을 찾지 못해서 질문을 합니다. 몇일전에 핸드폰 변경을 하게 되면서 백업을 하다가 온라인동기화 기능을 사용하기로 맘 먹었습니다. 그래서 버튼을 클릭하면 처음 온라인 동기화 할때처럼 아이디랑 패스워드 입력하는 창이 뜹니다. 입력을 하지 않고 컬러노트 어플을 껐다가 다시 켜서 온라인 동기화를 클릭하면 '마지막 동기화 실패 : 몇월 몇일 서버에러' 이런식으로 확인이 됩니다. 로그아웃은 가능하지만 로그아웃을 하면 메모장 내용이 사라지고 sd에 백업해놓은것으로 다시 복원하면 온라인동기화 계정도 같이 살아나는것때문에 질문합니다. Love the ColorNote app. 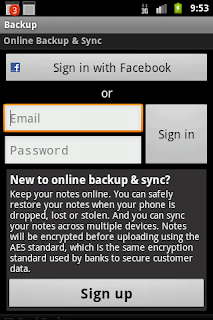 I used the "backup note" feature on my Droid, and copied the files to my pc via USB backup. But since I can't view the files on my pc, I'm not sure what's there. I am getting a new phone this month and don't want to lose my ColorNotes. Can I restore my backup on any kind of new phone? It would be really great if I you released a pc application that has the same functionality as the mobile one, and that syncs with the mobile one. I suggest you go ahead and check how many searches there are for 'ColorNote for pc' on google. PLEASE - desktop with sync to phone!!! Hi; any news yet on how to resolve the "Connection expired please sign in again" problem? Love this app; please fix this bug. THANK YOU!!! Please add "last day of the month" for reminders! a list view for all scheduled calendar entries similar to the google calendar agenda view would be awesome! it's really helpful to see all upcoming events without having to click individual days; it's the only reason i still keep google calendar. also, a more customizable alert would be nice. like being able to pick tues/thursday (for my lab) or mon/wed/fri (for piano class) without having to manually enter the info in for each day would be cool. all in all, i love colornote! way more intuitive than rtmilk or any of the other 3 or 4 note apps i tried. I have the most incredible update for your app...I can guarantee that anyone with children who have busy schedules will get this app. I want to share it with you, but have no idea how to communicate it to you. isabel marant manly suede and leather knee boots Carrier developing styles coming from traditional are really using theirselves with creating far more remarkable shoes to perform the specific moyen wants regarding consumers. How do you find out how to use this app? Hello is it possible to make a widget that shows the tomorrow To Do List? Desktop!!!!!!!!!!!!! Make a desktop version that syncs with the phone ap! Please, please, please, please, PLEASE! We are all asking for it. I would pay for it. Please! Excellent web site.This is terribly informative.. This is great information for students. This article is very helpful i really like this blog thanks. I also have some information relevant for buy dissertation proposal . Super-Duper site! I am loving it!! Will come back again - taking you feeds also, Thank you for sharing a nice article. I enjoy you because of every one of your effort on this site. My mum enjoys setting aside time for internet research and its easy to understand why. Awesome list, there's some real gems in there that I've added to my reading list! Thanks! Really nice information with nicely explained with each small details. I am really glade that this site is amazing to me. I am impressed by this site, nice work keep it up. Thanks a lot for informing us that ColorNote 3.6.0 is released. Rewriting a Personal Experience Essay. You are doing a very good job by informing us on such important matters. Thanks a lot for sharing. Thanks for sharing nice information with us. Five Nights at Freddy's is a horror violent game with a bit of survival skills. Game KingRoot apk is a dedicated support tool for the Android operating system, allows users to root any Android device with just a simple click. Entrar no Outlook is a free. Keep your inbox clutter-free with powerful organizational tools.